Earlier this month Capcom did an about face, declaring that despite initial intentions, upcoming fighter Super Street Fighter IV would indeed get an arcade release in Japan. But how did it come about? Speaking to Kotaku in March, producer Yoshinori Ono said the company had no plans because Capcom felt that there wasn't enough support among arcade owners for a release. It would need thousands of orders to happen, he said. A month later, Ono found himself at a Street Fighter tournament confirming that the game was going to come to arcades afterall. "What changed," Ono told Kotaku last week, " was that I was in the middle of lobbying various branches of Capcom for the capital to release the game to arcades" in March. And the orders starting coming in as well, he said. "Now it looks like we can make enough money off of the release to warrant an arcade version," he said. 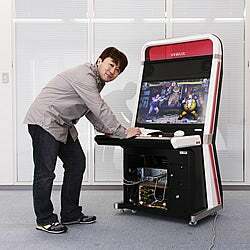 Great news for arcade fans in Japan. And Ono said that those arcades that decide to upgrade their Street Fighter IV machines to Super Street Fighter IV will only have to change out the hard drives. No new cabinet or board needed.